Having lived in Catalonia for five years now (time sure flies when you have so many festes to choose from!) I especially look forward to autumn and winter when some of the weirdest and most wonderful festivities of the region happen. Although more and more people celebrate Halloween these days, originally it was all about the Castanyada, a Catalan folkloric festivity celebrated on the “Dia de Tots Sants” (in Catalan. Día de todos los Santos in Spanish. All Saints’ Day or Day of the Dead in English). Traditionally the day was to honour and remember those who are no longer with us, and to celebrate autumn. The origin of this festivity is found in an ancient burial ritual celebration where families gathered around the table to eat the typical autumn fruit and vegetables (chestnuts – castanyes, sweet potatoes – moniatos, pumpkin –carabassa, etc.) and other sweet treats (candied fruit and little nutty, marzipan balls –panellets), as they remembered their dead. This highly energetic food also allowed the “Campaners” ring the bells all night to honour the deceased relatives. To those who come from outside Catalonia it may seem a little strange to see so many stalls where they sell fresh chestnuts and sweet potatoes roasted in the fire (I did when I first arrived), but now I can’t get enough of them, they are delicious! Especially the crazy, most common way of eating the moniatos; cutting them in half and eating them with spoon like a yogurt. Don’t forget the little glass of sweet moscatel wine too, much needed to wash the panellets down. After all, the 1st of November is a national holiday here so you can enjoy a lie-in to help with your sugar come-down from all the sweet treats! It’s a great time for families with children too as many events are put on in towns and cities across the region. One year I attended a pumping carving competition at the Fira de la Carbassa festival in Calaf – who knew how many shapes, colours and size pumpkins existed or how much pumpkin carving talent there was in Catalonia! Autumn is a great time to see castellers, the human towers famous in this part of Spain. Another thing that I don’t even blink an eye at now I’ve lived here for a while, but friends and family who come to visit find fascinating to watch. How does the towers stay so perfectly balanced when they reach such insane heights? And how is the person at the top (usually a small child) not petrified of plummeting to the ground from ten stories high? There is no mechanical help and the activity, which is over 200 years old, is now acknowledged by UNESCO as Intangible Cultural Heritage of Humanity and it is definitely worth going to watch. Autumn weather in Catalonia is not what us Brits are used to. Fresh mornings turn into stunning days with sunshine and warm temperatures - frequently reaching 20 degrees which is a welcome change after the hot summer and nice to enjoy before the chillier winter temperatures. Come December, many Catalan towns and cities have put up their Christmas lights, decorated main squares and set up stalls selling artisan food, ornaments and clothing ready for the Christmas season. I love walking around with a hot chocolate and buying Christmas presents for family and friends. One stall that always catches my eye is the one selling el tió, the Catalan take on Santa Claus and also very different to anything you’ve ever seen! 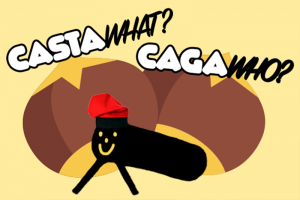 It’s basically a big piece of wood cut in the shape of a log that “stands up” with stick legs, has a broad smile and little red sock hat, la barretina! My first Christmas had me thinking, what on earth is that but is now something that makes a Christmas in Catalonia complete. Children take care of el tió traditionally from the 8th of December, giving him a little food to eat and covering him with a blanket so he won’t be cold. Wait it gets more interesting... Then, on Christmas Day children hit the log with a stick, sing Christmas songs, like el tió de Nadal, and wait for him to poop small presents like sweets, nuts and torrons. This is how it also became known as caga tió, the pooping log! As the tió can only bring small gifts (now you know why! ), children in Catalonia and Spain in general receive a lot of their larger gifts in January, when they celebrate Three Kings Day – El Dia de Reis. Children each leave a shoe out on the eve of January 5th and eagerly wait for the three kings to leave presents in them for the following morning. The day is also celebrated by eating a ring cake – el Tortell de Reis, that is decorated to look like a crown that a king would wear. It is often topped with glazed fruits representing the jewels of a crown. The best part is waiting to see whose piece has the king figurine hidden inside as this is supposed to bring them good luck for the year. Then the person who finds the plastic bean is supposed to pay for the cake the next January! Each town holds a Cavalcada dels Reis Mags – a procession where floats of colourful kings parade the streets and throw sweets into the crowd. In Barcelona the kings even arrive by boat! If you’re smart you’ll bring an umbrella, turn it upside down to collect the sweets being thrown. I love the Three Kings celebration as come January in The UK everyone is back at work and dieting off their Christmas indulgences. Instead in Catalonia there are more dinners, events and festivities to get you through the colder days and longer nights. However quirky and original these may all seem, they are definitely worth seeing and experiencing for yourself. After the summer is over it’s so nice to have more fun and festes to look forward to before and during winter.